In two earlier blog posts, I look at evidence compiled in Senate testimony by Stanford economist Mark Duggan arguing that financial incentives are driving a growth in disability rolls. I cite research showing that disability benefits aren’t growing relative to earnings and that age-adjusted disability incidence isn’t rising, though there has been a modest increase for women offset by a modest decline for men. 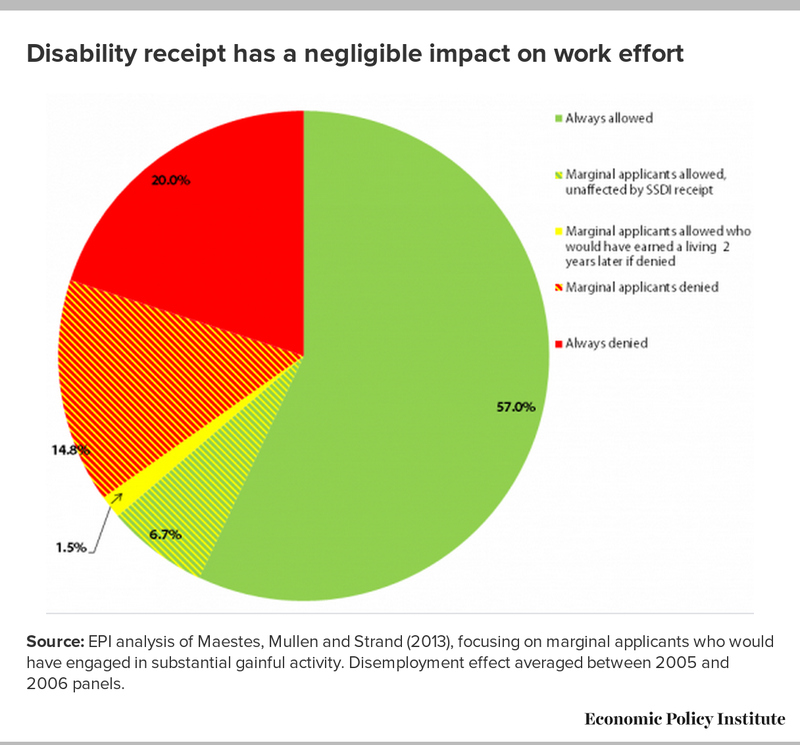 This isn’t surprising, because as we’ll see in today’s blog post, even research cited by Duggan and other critics shows that disability receipt has a negligible impact on work effort. Very few beneficiaries would be able to support themselves by working if they weren’t receiving benefits, based on the dismal employment prospects of rejected applicants who were on the margin of being accepted. Though Duggan and other critics claim disability insurance reduces employment, the Social Security Disability Insurance (SSDI) program creates strong incentives for beneficiaries to stay in, or return to, the workforce. Beneficiaries are allowed to earn up to $1090 a month (the current threshold for “substantial gainful activity”) with no reduction in benefits. Since most disabled beneficiaries rely on modest government benefits for most of their incomes (see the Center on Budget and Policy Priority’s informative chartbook), the fact that fewer than 10 percent avail themselves of this opportunity suggests that for most, even part-time or intermittent work isn’t an option. Another 4 percent are able to resume “substantial gainful activity” as their health and job prospects improve. Though the latter will forgo cash benefits if they remain gainfully employed above the SGA threshold for more than 12 months, they retain health benefits regardless of earnings for a longer period and are eligible for expedited reinstatement of cash benefits if their earnings drop. In short, the SSDI program is designed to encourage beneficiaries to return to or stay in the workforce. Despite these incentives, Duggan cites studies showing that receipt of disability benefits reduces work effort. But a closer look at the research shows that any employment effect is very modest. Looking only at applicants who made it past the initial “technical denial” stage, Maestas, Mullen and Strand (2013), probably the most prominent and careful of these studies, found that among marginal applicants–the estimated 23 percent of applicants who might be accepted or rejected by different examiners–receipt of disability benefits reduces the share who are earning a living two years later by around 18 percentage points. 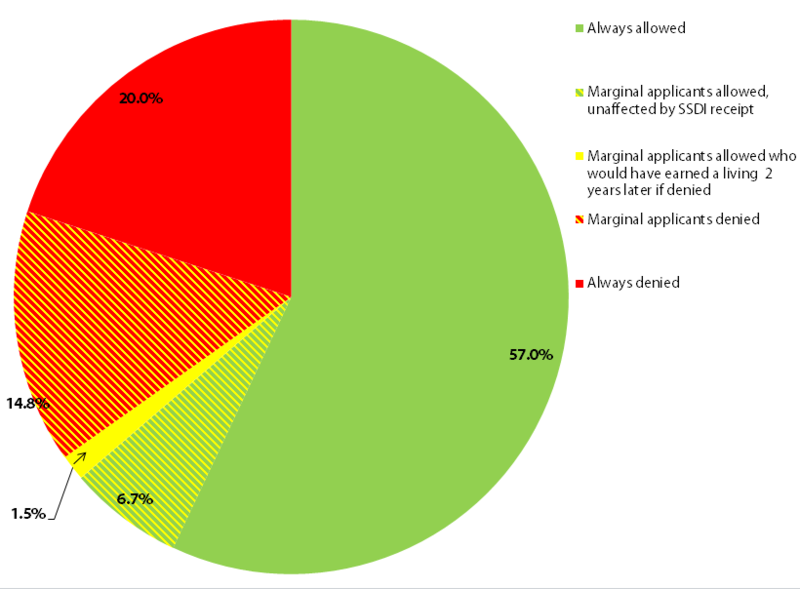 Since most marginal applicants are denied, however, this amounts to just 1.5 percent of total applicants (see Figure 1)–or 2.3 percent of accepted applicants. Moreover, the employment effect weakens over time, as nearly half the beneficiaries who would have tried to work would not have lasted two additional years in the workforce. Source: EPI analysis of Maestes, Mullen and Strand (2013), focusing on marginal applicants who would have engaged in substantial gainful activity. Disemployment effect averaged between 2005 and 2006 panels. It might seem surprising that critics like Duggan interpret the findings of this paper as showing a “substantial” effect on employment (the authors themselves use the word “large”). This is because they never acknowledge the small number of marginal applicants who are accepted, and because they focus on the share of marginal applicants who would be able to earn any amount above $1,000 in a given year, not just those able to engage in “substantial gainful activity” (work that pays at least $1,090 per month). These findings don’t show that examiners are admitting many applicants who shouldn’t qualify because they’re able to earn a living. A more reasonable interpretation is that examiners are turning down too many marginal applicants, not too few. Among all applicants who were turned down, including those who stood no chance of being accepted under current rules, nearly three quarters (72 percent) weren’t earning a living above the SGA threshold two years later. Multiplying this share by the roughly 15 percent of applicants who were marginal and denied benefits suggests that nearly 11 percent of applicants were denied but should probably have been accepted–seven times the number who were accepted but should probably have been denied. This will underestimate the share of applicants who should have been accepted if marginal applicants are in worse health and have worse employment prospects than rejected applicants who clearly do not qualify for benefits. Next: Does Disability Insurance Reduce Labor Force Participation? Previous: Are Disability Benefits Becoming More Generous?